All of the testimonials below were written by our customers after work had been completed for them. "Very pleased with the finished article. Work was carried out on schedule with a minimum of disruption." "D.P Cox Woodworks of Rugby were very professional, efficient, helpful and courteous in the manner in which they carried out the work and I would certainly recommend them, and have any future work done by them." "David has successfully tackled many wood work for us to help preserve a 175 year old house. Wood works for David!" "Dave Cox is a supremely talented carpenter. He has carried out a few jobs for us and I'm already planning his next project in my house! Dave was happy to work with my design for some fitted wardrobes, but discussed things I hadn't considered, which was really helpful. The wardrobes look like they have always been part of the house - we couldn't be happier. Dave is very polite, excellent at keeping you informed of his progress (when working in his workshop etc), produces work of excellent quality and leaves your space clean and tidy." 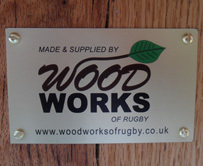 "Could not recommend Woodworks of Rugby highly enough. Always professional, helpful and reliable. The work was excellent and everywhere was clean and tidy when finished." 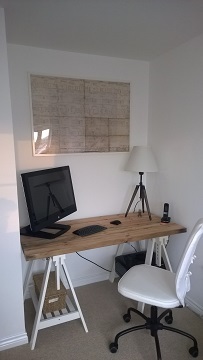 "We have used David Cox on a number of occasions, both for significant jobs such as window construction and for making small sections of skirting board to match our Edwardian style. He is an excellent craftsman, reliable, a clean and tidy worker, who will always provide a high quality product. We have recommended him to several of our friends who have also been pleased with his work. We will certainly use him again." "Bespoke computer cupboard unit made to fit space. Service excellent and very good job done. Would definitely recommend." "We have used Dave (Mr Cox) on a couple of occasions now and have only ever been pleased with his work. The last time he worked for us, we wanted a fire surround to match some existing furniture that we have in our living room and to say that we were pleased with the result would be an understatement. He showed a lot of care and precision in locating the right oak to match the existing furniture and the final result far surpassed our expectations. A+." 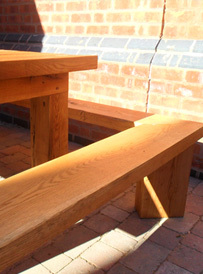 "Woodworks did an excellent job for us - well executed, and to specification and quotation. We would recommend this service to anyone." 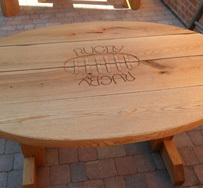 "I knew exactly the type of garden table I wanted, but could not find it anywhere until I met David. He designed and made exactly that table! It is aesthetically pleasing and robustly made - a perfect addition to my garden". "Dave is a very hard worker and helped us plan the new reception desk just how we wanted it.The work has been done to a very high standard and many of our patients have commented on how good it looks.It was a pleasure working with Dave and we would always call him for any other work we need doing." - Clifton Road Surgery Rugby. "Dave was able to realise what we could visualise our kitchen being and carry out the works to the highest standard.We could not be happier with the work." "I am pleased with Daves attention to detail. All work is carried out to a high standard. Dave demonstrated he is serious about his work, his level of professionalism is very high.I'd be delighted to reccomend dave to my friends". - O.Polak Rugby 3 x Fitted wardrobes and upgrade of stairs. "All work was carried out to a very high standard and sympathetic to the style and age of the property. Always came when he said he would, cleaned up after work every day. Excellent value from a true gentleman, a pleasure to have in your home". - Mr and Mrs Brackenridge Stretton Under Fosse Replacement Hardwood windows, Stair alterations, Stable door, internal doors. "We are delighted with the quality of work completed by Wood Works of Rugby in erecting our garden fencing, erecting our pergola and laying down slabwork. The professionalism and quality of work was excellent. We would recommend them wholeheartidly." - Mr A. Kirby Rugby Pergola, Slabwork, Fencing. "I would not hesitate to recommend David Cox to anyone wanting this sort of work, or related Carpentry or Joinery. He has always done a good job for us hence all the repeat work." -Mr D. Kallmieir Rugby Ash Stairs, Fitted Bedroom, Replacement kitchen doors, boxing in, Internal doors, Bespoke solid oak fitted cupboard /shelving unit.